AASA Executive Director, Dan Domenech, with Principal Gretta Mendez at the Cerro Alegre school. La Fortuna, Costa Rica – Gretta Mendez was assigned to become the principal teacher of the one-room Alegre (Happy Hill) School three years ago. Unless you know where you are going, you would never find it. First of all, it’s not a school building. It’s a small Catholic Church in the mountains of Chachagua. The local priest allows Gretta to use the church as a school. There is an empty lot next to the church that the government purchased to build a school but that seems to be years away. Most of the children who attend Cerro Alegre come from Nicaraguan families that are in Costa Rica illegally. There is an existing school that the children could attend but it’s so far from their homes that most of them would not go to school at all. While visiting Cerro Alegre the children regaled their AASA visitors with native dances and songs and then invited their guests to do the Hokey Pokey. Typical of Costa Rican schools, the children are divided into morning and afternoon sessions each lasting about four hours. Gretta teaches both sessions. The school is very much in need of resources and the AASA guests were eager to help out with donations and promises to send pencils, notebooks and furniture. It’s a tough assignment and Gretta confesses that many a day she considers leaving Cerro Alegre to go teach in a conventional school, but then she looks at the faces of her children and she knows she will never abandon them. She knows that they would never travel the distance it would take to go to the school in town. She knows that many of the undocumented parents would not risk sending their kids to the regular school. So Gretta stays and makes the most of it with the contributions she receives, the borrowed space from the local priest and the most beautiful smiles from the children she loves and teaches. Dan is blogging throughout the AASA International Seminar, which is taking place in Costa Rica. 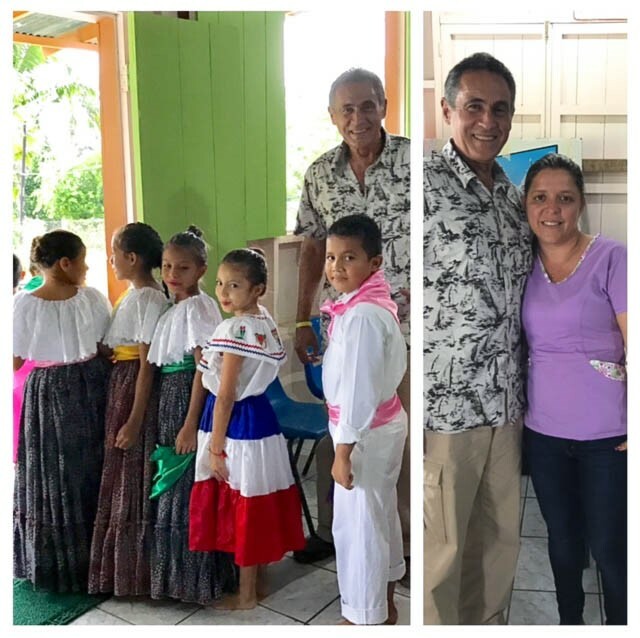 This entry was posted in Education and tagged AASA Executive Director Dan Domenech, AASA in Costa Rica, AASA International Seminar, AASA International Seminar in Costa Rica, Dan Domenech Blog by Dan Domenech. Bookmark the permalink.